So how do you like Ms. Witch? I cast her off yesterday, and then showed her to Emi when he came home from school, thinking that she would be of no great interest to a nine year old boy like him, but he immediately fell under her spell. I love her, he said. Can I have her? She can sit beside Swampy, and keep him company when I'm at school. Now I should explain that Swampy is the latest addition to Emi’s growing menagerie. Swampy is a carnivore, aVenus Fly Trap plant, who hangs out on the mantelpiece in Emi's bedroom. We got Swampy a few weeks ago by way of a Sunday afternoon bribe for doing a heavy weekend of homework. And every day since then Emi has been very conscientious about giving Swampy a drink. The plant label told us that he liked to live in swamps – hence the name, and the zealous watering regime. Anyway I digress: back to Ms. Witch. 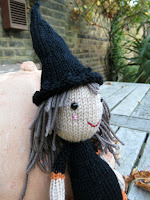 She’s made using Worsted weight yarn. I’ve used Sublime Extra Fine Merino Worsted, which is a truly lovely yarn to work with: really soft with little tendency to split. I chose autumnal colours to match the season: Wicker (061) for the skin tones, Jet Black (013) for the black bits, Mole (056) for her brown hair and Marmalade (478) for the pumpkin orange bits. When I’m making toys I like to use smaller needles than they recommend for the yarn in order to get a nice tightly woven knit. To my way of thinking it wouldn’t look good if we were able to see Ms Witch’s stuffing through her dress. For this weight of yarn you’d normally use 4.5 mm needles, but I chose to use 3 mm needles to get the desired result. This produced a tension of 25 stitches x 30 rows for a 10cm x 10 cm/ 4" x 4" swatch. If you’d like to make her, she’s pretty straightforward. Just read on for the pattern. Knit 2 rows in stocking stitch i.e. knit the first row and purl the second and carry on knitting the odd rows and purling the even ones. Row 3: Knit into the front and back (kfb) of each stitch – at the end of this row you will have 6 stitches on the needle. Row 5: kfb of each stitch across the row –increasing the number of stitches to 12. Rows 6 to 10: work in stocking stitch, starting with a purl row on row 6. Row 11: *Knit 1, Knit 2 together* across the row, decreasing the number of stitches to 8. Rows 13 to 34: work in stocking stitch. At the end of row 34 cut the skin-coloured wool and join the orange wool. 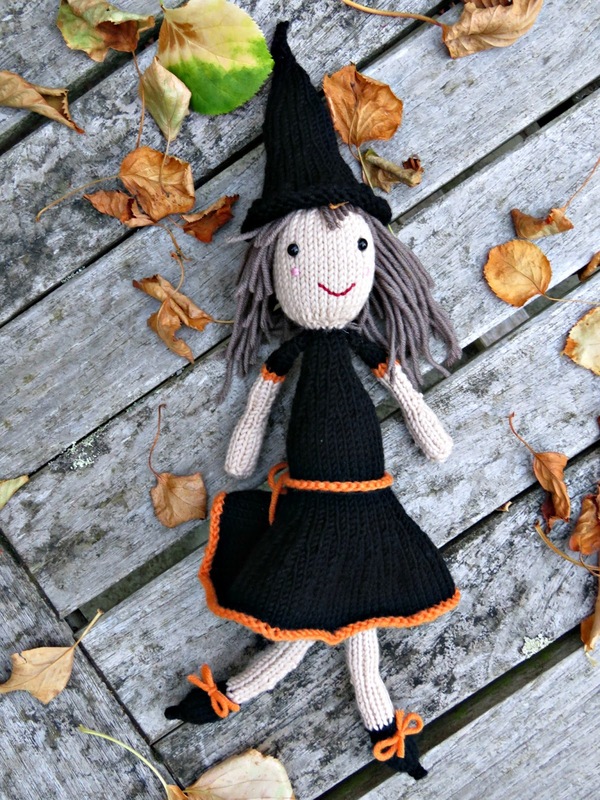 We’re going to carry on in orange to knit the right leg of Ms Witch’s pumpkin pants, which she wears under her skirt to keep herself warm when she’s out flying her broomstick … . 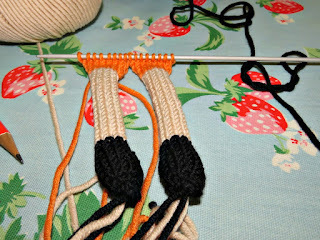 Rows 35 to 40: work in stocking stitch using the orange wool. At the end of row 40 cut the yarn, and leave the stitches on a spare needle or a stitch holder, while you knit the second leg. Now make a start on the left foot by following the above pattern for the right foot and leg, but when you’ve finished row 40, do not cut the yarn. You will use the orange coloured yarn to knit across both legs on row 41. This will give you a row of 16 stitches. Row 43: *knit1, kfb of next stitch*. Repeat from * to * across the row to increase the number of stitches by 8 to 24 i.e. at the end of this row you will have 24 stitches. Rows 44 to 46: work in stocking stitch. Row 47: *knit 2, kfb of next stitch*. Repeat from * to * across the row to increase the number of stitches by 8 to 32 i.e. at the end of this row you will have 32 stitches. Rows 48 to 52: work in stocking stitch. At the end of row 52 cut the yarn and join the skin coloured yarn. 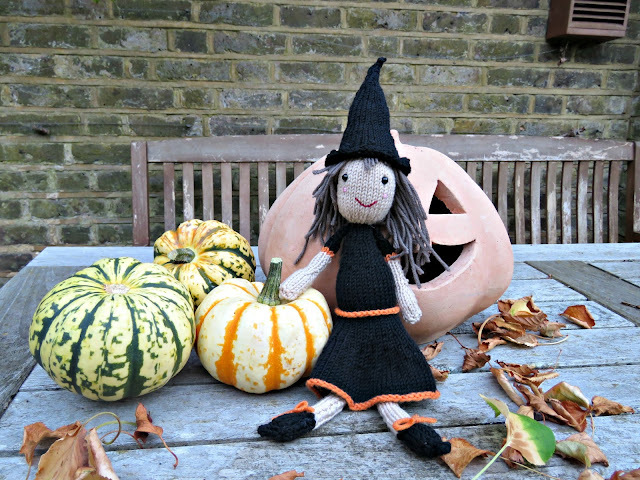 You’ve just finished Ms Witch’s pumpkin pants! Rows 53 to 70: work in stocking stitch in the black yarn. Row 71: *Knit 2, Knit 2 together*. Repeat from * to * across the row, decreasing the number of stitches by 8 and leaving you with 24 stitches. Rows 72 to 74: work in stocking stitch. Row 75: *Knit 1, Knit 2 together*. Repeat from * to * across the row, decreasing the number of stitches by 8 and leaving you with 16. Rows 76 to 78: work in stocking stitch. Row 79: *Knit 2, Knit 2 together*. Repeat from * to * across the row, decreasing the number of stitches by 4 and leaving you with 12. Rows 80 to 82: work in stocking stitch. Row 83: *Knit 2, knit 2 together*. Repeat from * to * across the row, decreasing the number of stitches by 3 and leaving you with 9. 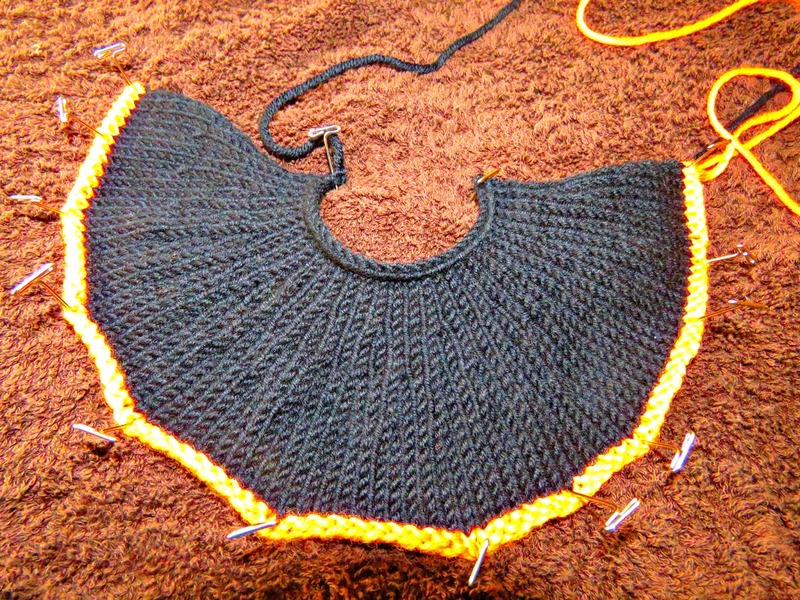 Cut the yarn and join the skin-toned yarn to knit the neck and head. Rows 85 and 86: work in stocking stitch. Row 87: kfb of every stitch across the row, doubling the number of stitches to 18. Row 89: kfb into every stitch across the row, doubling the number of stitches to 36. Rows 90 to 106: work in stocking stitch. Row 107: knit 2 together all the way across, halving the number of stitches to 18. Row 109: knit 2 together all the way across, halving the number of stitches to 9. Row 111: *knit 1, knit 2 together*. Repeat from * to * all the way across. By the end of this row you should have 6 stitches. 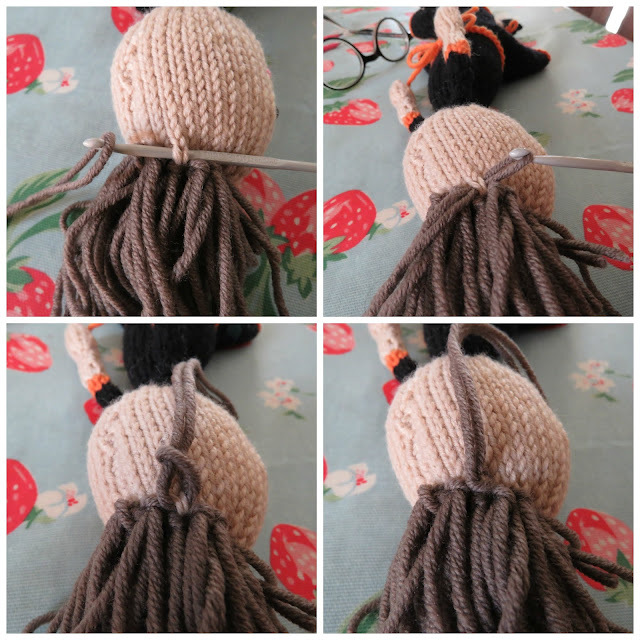 Cut the yarn and draw it through the remaining stitches, pulling them tight to form the top of the head. Cast on 6 stitches using the skin-coloured yarn. Row 1: *knit 1, kfb of next stitch*. Repeat from * to * across the row, increasing the number of stitches by 3 to 9. Rows 2 to 8: work in stocking stitch. 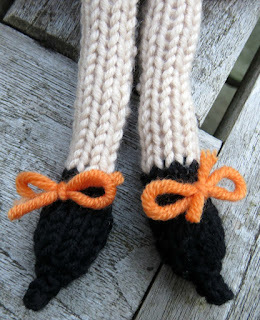 Row 9: *knit 1, knit 2 together* across the row, decreasing the number of stitches by 3 to 6. Rows 10 to 18: work in stocking stitch. 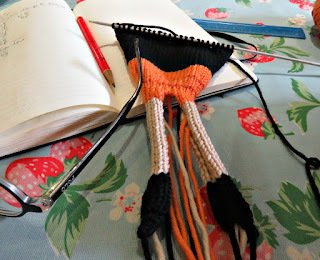 Cut the yarn and join the orange yarn to knit the trim on the sleeves. Rows 19 and 20: work in stocking stitch using the orange yarn. 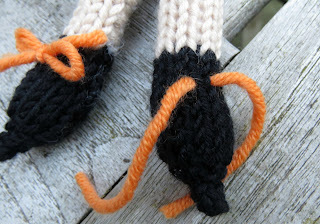 Cut the yarn and join the black yarn to knit the sleeve. Rows 21 to 24: work in stocking stitch. Row 25: *knit 1, knit 2 together*. Repeat from * to * across the row reducing the number of stitches to 4. Row 27: knit 1, knit 2 together, knit 1. At the end of this row you have 3 stitches. 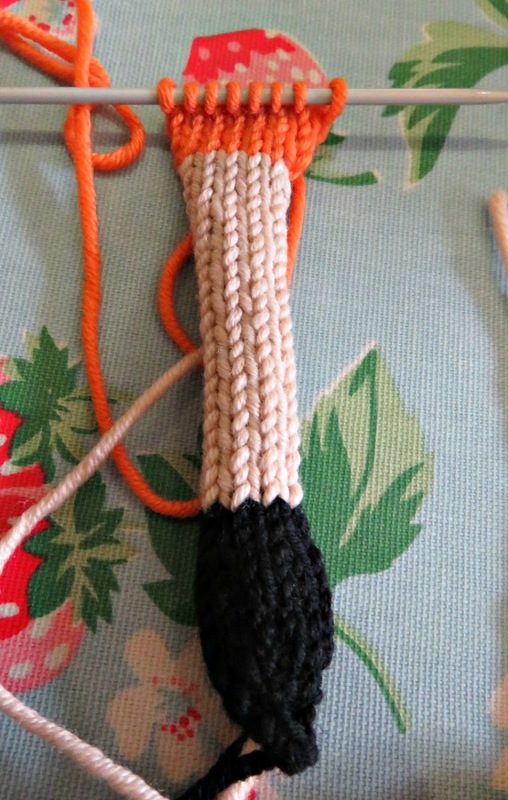 Cast on 88 stitches using the orange wool. Cut the yarn and join the black yarn to knit the rest of the skirt. Knit in stocking stitch until the skirt measures 2½ cm/ 1 " ending with a purl (wrong side row). 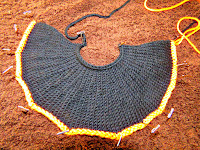 Shaping Row 1: (right side row) *Knit 2, Knit 2 together*. Repeat from *to* across the row. By the end of this row you will have lost 22 stitches and have 66 stitches remaining. Rows 2 to 4: work in stocking stitch. Row 5: *Knit 1, Knit 2 together*. Repeat from * to * across the row. By the end of this row you will have lost 22 stitches and have 44 stitches remaining. Rows 6 to 8: work in stocking stitch. Row 9: *Knit 2, knit 2 together*. Repeat from * to * across the row. By the end of this row you will have lost 11 stitches and have 33 stitches remaining. Rows 10 to 14: work in stocking stitch. When you've cast off the skirt, you really need to block it so that it doesn't curl. Just pin it out on a nice thick towel into its proper shape, steam spray it with an iron hovering just above the wool without touching it, leave it overnight and when you unpin it in the morning it will be super well behaved - I promise! 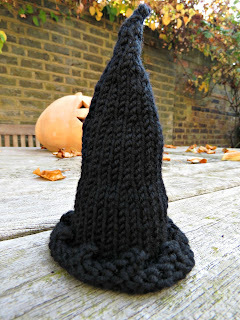 This edging will naturally tend to curl up and form the brim of the hat. We won't block it, but instead we'll leave it to do its thing and curl up. Rows 1 to 6: work in stocking stitch. Row 7: *Knit 2, Knit 2 together* across the row. By the end of this row you will have lost 10 stitches and have 30 stitches remaining. Rows 8 to 16: work in stocking stitch. Row 17: Knit 1 *Knit 2, Knit 2 together*. Repeat from * to * until last stitch, knit 1. By the end of this row you will have lost 7 stitches and have 23 stitches remaining. Rows 18 to 26: work in stocking stitch. Row 27: knit 1, *knit 1, knit 2 together*. Repeat from * to * to last stitch, knit 1. By the end of this row you will have lost 7 stitches and have 16 stitches remaining. Rows 28 to 32: work in stocking stitch. Row 33: *knit 2, knit 2 together*. Repeat from * to * across the row. By the end of this row you will have lost 4 stitches and have 12 stitches remaining. Row 35: *knit 2, knit 2 together*. Repeat from * to * across the row. By the end of this row you will have lost 3 stitches and have 9 stitches remaining. Row 37: *knit 1, knit 2 together*. Repeat from * to * across the row. By the end of this row you will have lost 3 stitches and have 6 stitches remaining. Row 39: *knit 1, knit 2 together*. Repeat from * to * across the row. By the end of this row you will have lost 2 stitches and have 4 stitches remaining. Row 41: Knit 2 together, knit 2 together. This will leave you with 2 stitches. Sew the witch's body, head and legs. Stuff with some soft toy stuffing. Before sewing up the head insert some safety eyes, aligning them so that they sit evenly on her face. Please note that these eyes are not recommended if you are going to give Ms Witch to anyone under the age of 3. If that is the case it would be safer to embroider some eyes that won't create a choking risk. Sew up the arms and attach. Lace the lengths of the brown wool through her head with a 3 mm crochet hook to form her hair. It's best to start at the top and work your way down her head until you get a hairstyle that you like. 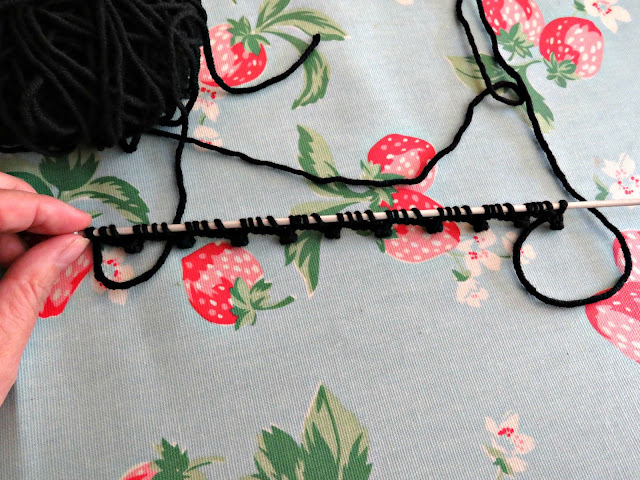 I laced a double length of the wool through, each time, and then pulled the ends through the loop as shown in the photo below so that it holds tight. Don't pull too tightly or you'll disfigure the texture: gently does it. Crochet a belt for her waist in orange wool. I did a one chain crochet, which I tied in place using the cast on and cast off ends to create a bow at the back. 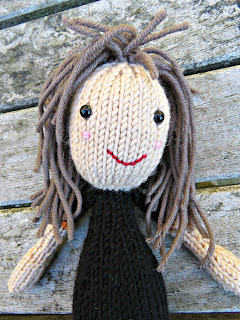 I used some embroidery thread to give her a smile and two pink cheeks. 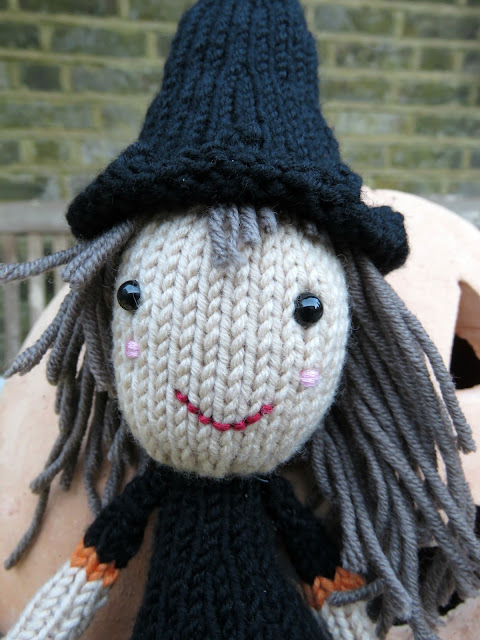 Be careful with your stitch tension here: don't pull the thread too tight - leave it nice and relaxed otherwise it will distort Ms Witch's face. 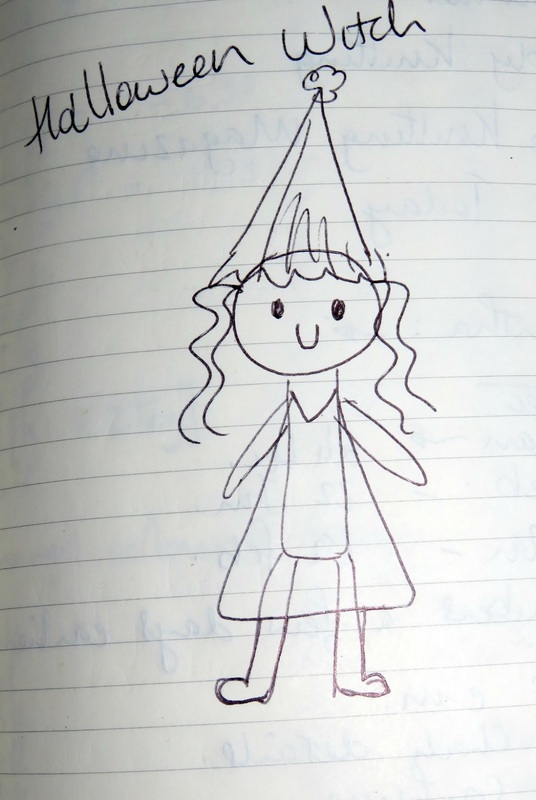 She originally looked like this on my jotter when I was trying to figure out how to make her. And here she is in the flesh.